NEWS: Screw Products, Inc. Logo T-Shirts Now Available! 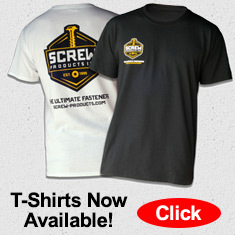 - Star Drive Wood Screws - Screw Products, Inc.
Show your colors with a Screw Products, Inc. T-Shirt! The right chest has a small 2-color screen printed logo and a full-back 2-color logo. Made of preshrunk 5. 6oz. , 50/50 cotton/polyester fabric. Features a seamless body with set-in sleeves and shoulder-to-shoulder taping. Double needle cover stitching on front neck. Free Shipping in the USA!